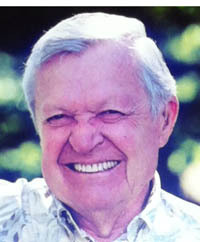 Reid S. Barker passed away peacefully on Thursday, May 30. Reid will long be remembered by friends, family and local acquaintances for his engaging smile and easy-going manner. He dearly loved the Sun Valley area, first coming via the Union Pacific railroad from his home in Chicago in 1947. Reid and wife Nancy settled permanently in Ketchum in 1987 after selling his commercial printing business. Reid and Nancy were married for 68 years. They were the proud parents of three children (Lindy, Chris, Carter), six grandchildren and five great-grandchildren. He taught them all to love the Wood River Valley as he did. Reid was an avid skier, jazz lover, sailor and reader. Mountains and mountain climbing were his passion; now Reid’s soul is at rest in those mountains.